Let’s be honest, there are some recipes that are like the “traditional” recipes that you remember being on your holiday dessert table that you’d just be REALLY sad if you couldn’t eat them. Or share them with your grandkids, who happen to have terrible dairy-allergies. So, you find a way to make grandma’s old fashioned recipe work for you. 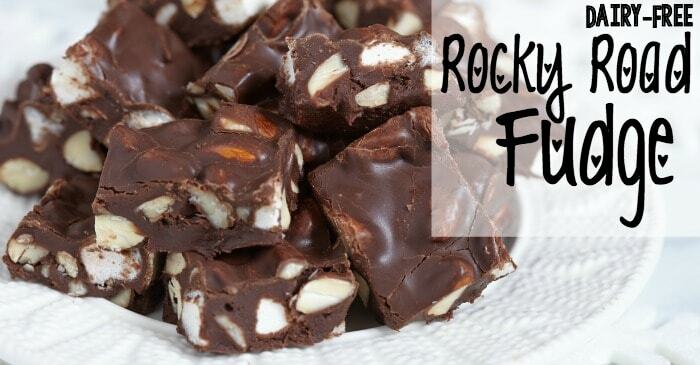 This awesomely easy Dairy-Free Rocky Road Fudge recipe is one of those for me. 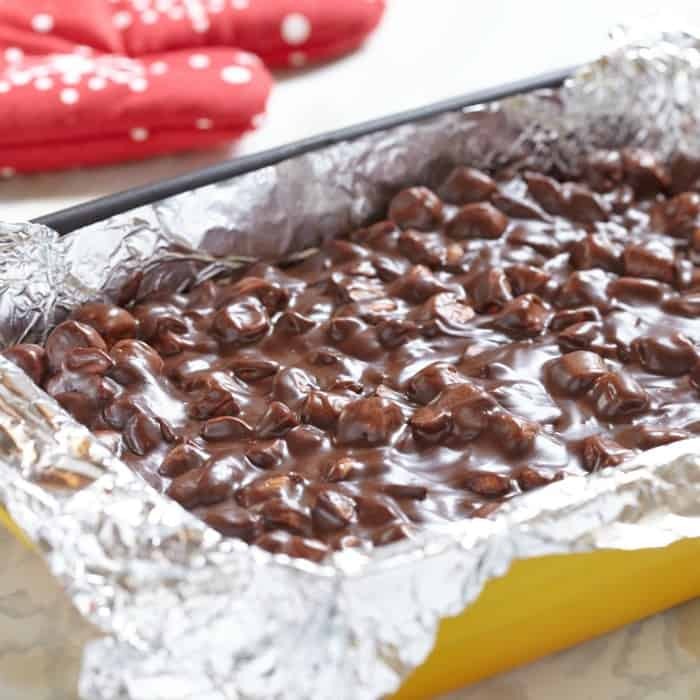 Every year, growing-up, my mom or one of us kids would make the rocky road fudge to bring to the holiday dinner. We’d each get a little bite of that just-over-the-top richness (oh, I can taste it melting on my tongue now) and then horde the rest. I can’t wait to share that same feeling with my grandkids. 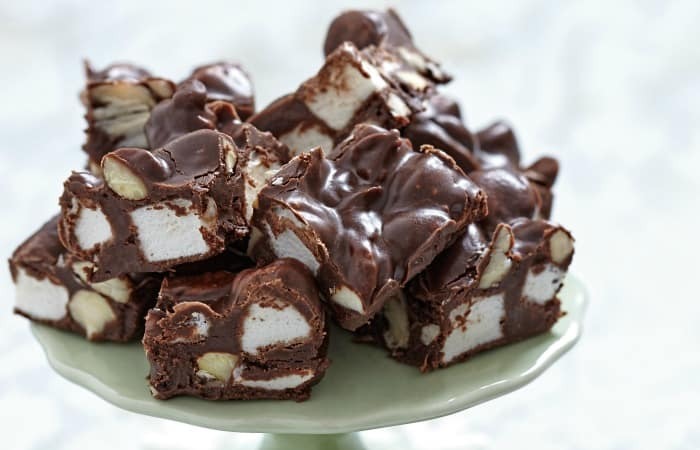 I’m not really sure exactly what it is that makes rocky road fudge so much better than any other fudgey-fudge out there, but, for some reason, the mixture of salty peanuts, gooey marshmallow and the rich chocolate–it just makes me drool. This poor batch of dairy-free rocky road fudge never even made it to the holiday dinner table, even though it would have kept for long enough. Nope, as soon as the photos were done, the fudge was on it’s way to be polished-off. Poor fudge. Guess I’ll have to make another batch. What a tragedy. Heh. 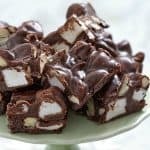 This Dairy-Free Rocky Road Fudge recipe is one of those recipes that I just can't have Christmas without. Every year, growing-up, my mom or one of us kids would make the rocky road fudge to bring to the holiday dinner. And it was just perfection. 1 cup roasted and shelled Peanuts If you like a lot of nuts, add more. Prepare an 8- or 9-inch baking pan by lining with aluminum foil. Grease the foil with 1 tablespoon of the dairy-free margarine. Spread peanuts in the bottom of the pan, then spread the marshmallows on top of the peanuts. In a 4-quart (or larger) dutch oven, combine the Sugar, Cocoa, Salt, and Cinnamon. Stir to mix thoroughly. Place pot on medium heat, slowly add Coconut Milk, stirring continuously until the sugar dissolves. Continue to stir until the mixture comes to a full boil. Reduce heat to prevent the pot from boiling over, but continue to boil. Using a candy thermometer, continue to boil, but do not stir, until the mixture reaches 234 degrees. Remove from heat and add 1/4 cup Dairy-Free Margarine and Vanilla--DON'T stir! Allow the mixture to cool until it reaches about 125 degrees. After the candy has cooled down, beat with a wooden spoon. The mixture will become thick and lose its gloss. Spread the fudge over the peanuts and marshmallows in the baking pan. When the fudge is completely cooled, cover the baking pan with a cookie sheet and turn upside down. Carefully remove the foil. Using a second cookie sheet, flip the fudge right side up, then cut into squares. Place in an air-tight container and store at room temperature.